Figure 1. (left) Plant showing no signs of recovery one week after the June 3 hail storm; taken June 10, 2014, near Uehling. (Source: Roger Elmore). Hail across much of Nebraska's corn and soybean growing area on June 3 left a path of crop destruction. 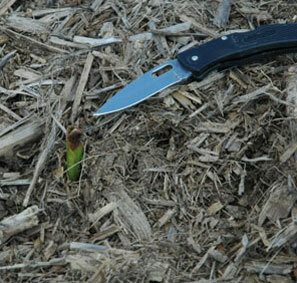 Photos from near Bradshaw, Marquette, and Uehling, tell a story of crop responses to the event. Figures 1 to 4 illustrate the impact of cool, cloudy, and damp weather following the storm. These conditions were not conducive to corn regrowth but were conducive to organisms developing in the stem directly above the growing point. Although the growing points were not damaged by the hail, the decay will eventually kill the plants. Figures 6 and 7. "Shot-holes" in corn leaves damaged by hail June 3 near Bradshaw, left, and Aurora, right. Damaged leaves were likely in the whorl near the base of the plants during the storm and were affected by hail stones hitting the plant stems. (Source: Roger Elmore, June 9, 2014). Many hybrids tiller naturally even at high populations. 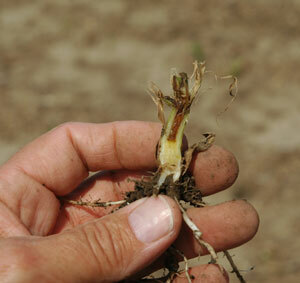 Tillers in some cases emerged as a result of damage to the main stem growing point (Figures 5-6). The odds of tillers producing a viable ear are not good. Leave check strips for a late-season assessment! "Shot-holing" and chlorosis in the upper leaves (Figures 6 and 7) were widespread in most fields following the June 3 storm. We hypothesize the shot-holing was probably due to hail stones hitting the lower stem and injuring the un-emerged, rolled-up leaves. We were able to correlate to some extent the number of shot-hole areas with the number of stem bruises on the lower stem. Several hundred people attended UNL Extension Storm and Hail Damage Information events at Bradshaw, Marquette, and Uehling this week (Figure 8). Figure 8. 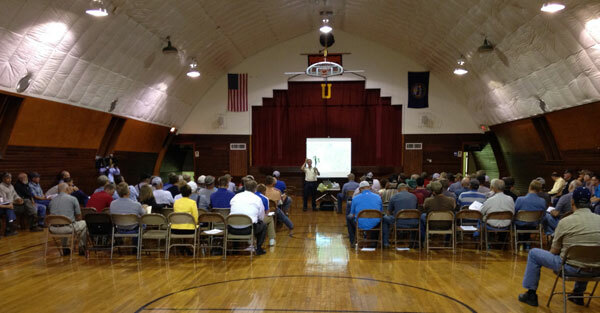 Over 120 people attended a UNL Extension Storm Damage Information meeting June 10 at the Uehling Auditorium. Meetings were also held at Bradshaw and Marquette.